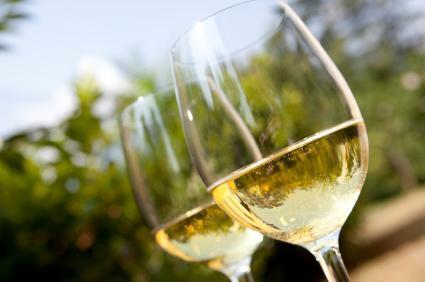 Explore the different types of white wines until you find the one that tempts your tastebuds. By trying different varieties, you might be surprised with what you like and what is available. Over 1,000 different wine-grape types, called Vinis Vinifera, are available for use in wine making. In Italy alone, there are so many different types of grapes and clones that in some cases it can be just resident to the little village where it's planted. But, beyond that, there are more mainstream white wine varietals that are well-loved by wine afficeinados. When talking about types of white wine, the first that comes to mind is often Chardonnay. It is one of the most popular selling white wine in the United States. Of all the whites, Chardonnay is one of the more complex wines. It can vary in taste from those that are full in body with hints of oak, butter and spice to those that are medium and are gold and velvety with display notes of fruit, nuts, or vanilla. Some variations have aspects of baked apple and caramel and a higher acidity so it can stand up to foods. There are many producers who make Chardonnay ranging from the $1.99 Charles Shaw to the pricey Coche-Dury out of Burgundy. An easy to drink Chardonnay is Robert Mondavi's Private Label which costs $12 and contains hints of lemon blossom, pineapple, and peach aromas along with smoky oak, vanilla spice and toasty brown sugar. If you have not tried a Chardonnay lately, go to your local wine store and explore the varieties available. Pinot Gris/Pinot Grigio are actually the same grape; one term is the French name, the other is Italian. Pinot Gris is actually the second favorite white wine variety sold in the US. A cousin of Pinot Noir, this grape produces wine with a little more body than you'd find in Sauv Blanc. On the nose it offers up minerality and pear notes, which go very well with seafood and lighter fare. This is a wine that is fun to experiment with and it won't break your budget doing it. Try versions of this white wine from American producers, Italian Pinot Grigio and then maybe some French Pinot Gris from the Alsace area. They are all different, and it is not only fun to try these from other places and producers, but also a great learning experience. Some Pinots to try are the affordable and easy to drink. A couple to try are the Santa Margherita Pinot Grigio or the sparkling frizzante Pinot Grigio. 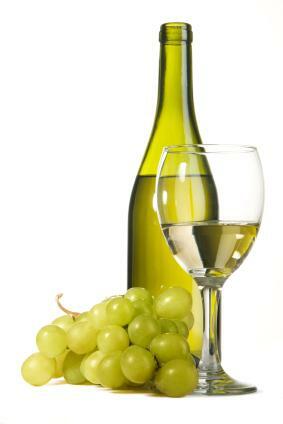 Sauvignon Blanc, sometimes called Fume Blanc, is a very popular white wine that seems to fit the bill for many people. If you don't like the richness of Chardonnay, but you still want something fruity, Sauvignon Blanc may be the one. This wine is a classic white wine varietal that is commonly planted in the Bordeaux and eastern Loire regions of France where it primarily got its start before coming to the US. Sauvignon Blancs are affordable, and because of the crisp acidity and citrus flavors, you can pair this with anything from coconut shrimp to nothing at all. Upon smelling this wine you can sense the lemon, grassy, grapefruit, and gooseberry aromas leaping out of the glass. This is a very aromatic wine! If you want a crisp and refreshing wine, try Sauvignon Blanc. There are many producers in California who are making superb Sauvignon Blanc wines, particularly in Northern California. A great California option is Geyser Peak Winery's Sauvignon Blanc. It is very acidic and has flavors of lemongrass, passion fruit and grapefruit. New Zealand is also making some wonderful examples of this wine. Don't pass a chance to try one such as Saint Clair Vicar's Choice Sauvignon Blanc. This pale straw color wine has flavors of gooseberry, black currant and grapefruit. Viognier is becoming more popular in the United States. Historically, winemakers in the Rhone area of France where this grape originally comes from added Viognier to their Syrah to bring out a vibrant fruit quality. Winemakers today are doing the same thing, which means that more and more of this grape is being planted in the United States, and thus more Viognier is being made on its own as well. This wine smells very tropical with a banana and peach character, and is loaded with floral aromas as well. It is a wine that definitely pleases the olfactory senses. Alcohol levels in this type of wine can be higher than other wines, so monitor your intake carefully. Since this wine has a pronounced floral and fruity richness, pair this with richer foods such as prosciutto-wrapped melon or baked brie cheese. Be sure to try d'Arenberg's The Hermit Crab Viognier Marsanne with subtle hints floral and characteristics of apricot and peach. Domaine Weinbach from, Alsace, France is crisp, with plenty of floral notes. Gewurztraminer is a floral, spicy and sometimes sweet wine from Germany, but produced in the US too. It has a light, crisp acidity and a bold flavor. Marsanne/Roussanne is frrom the Rhone area of France, and is a heavier flavor white with a nice floral bouquet. Semillon is primarily from the Bordeaux area of France and mainly used for blending into Sauvignon Blance and making late harvest sweet white wine. Citrus aromas are evident, but the wine is very rounded. Muscat is from France, but planted all over the world. Most are made into medium-sweet and dessert style table or fortified wines. If you're in your local wine store and you see a white that you don't recognize, ask the wine person for assistance. He or she may be able to guide you to the type you like or to try something entirely new. There are so many varieties of wine that you are sure to find one to suit your personal tastes.